Over the 2+ decades I’ve been visiting Thailand, coffee has become increasingly popular and available. This blog explores a few of the coffee experiences we had early in 2014 when we traveled extensively in the north of Thailand, in Phrae, Pua, Nan and Chiang Rai. 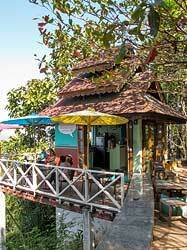 I see more and more coffee shops or “huts,” as they are frequently named, everywhere in Thailand. 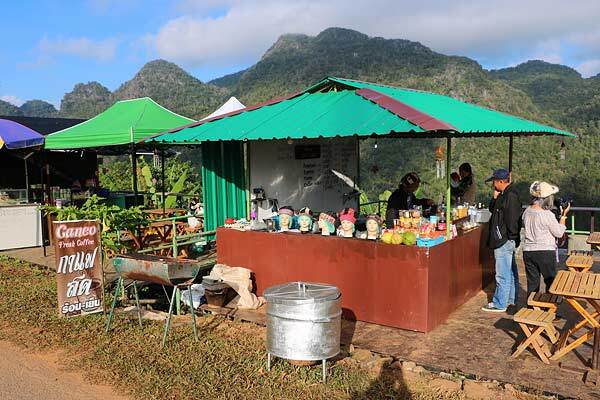 Driving through a town, or even just on the highway, there will be a coffee hut. In addition to individual coffee huts, there are many chains: Coffee World, Black Canyon Coffee, Doi Chaang, Amazon, Doi Tung (see below) and more. 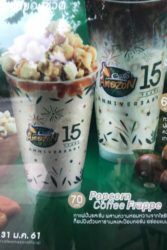 There are, of course, Starbucks – at over 140 in Thailand. 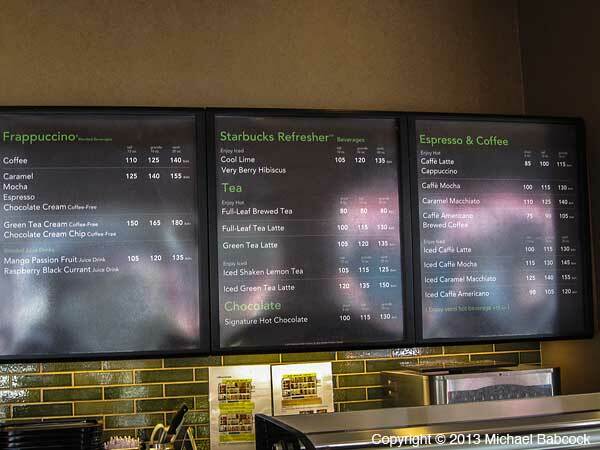 I did try Starbucks this year, mainly so I could write a bit about it. My advice: don’t go there. 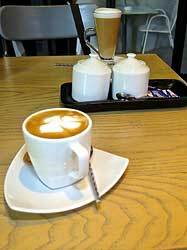 I find the coffee so-so and the drinks are larger, weaker and more expensive, costing about the same as in the states. 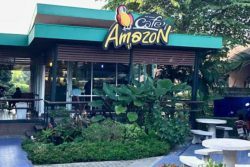 Increasingly many of the coffee places (Amazon, for example) have free wi-fi; at Starbucks the only option was an all-day password for 150 baht – about $5.00. For their prices: it should be free. 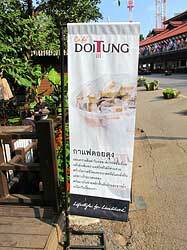 Doi Chaang is a fairly well-known chain out of Chiang Mai that serves Doi Chaang coffee beans. 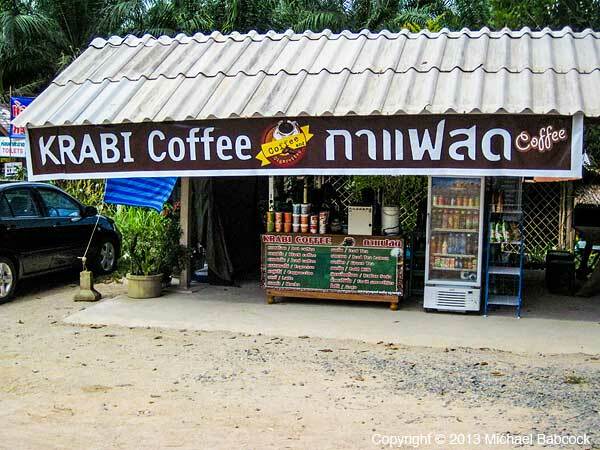 I was going to try it when I saw a branch at the Krabi airport but it was even more expensive that Starbucks – 100 baht for a latte, which, even accounting for inflated airport prices, was too much. I got a coffee at Black Canyon instead for 20 baht less. (It was good.) Of all the chains, we’ve had pretty good coffee at Amazon. Coffee culture is young and still evolving in Thailand, so often baristas don’t quite have all the details down about the various drinks. 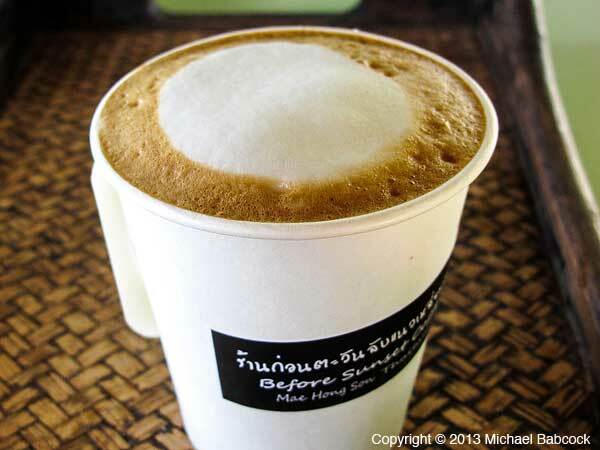 At a coffee shop at a temple in Chiang Rai I ordered a cappuccino, typically espresso topped with equal parts steamed and frothed milk. 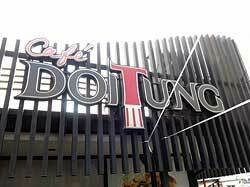 At this shop I was served my first frothless “cappuccino” ever; it was basically coffee blended with sweetened, condensed milk, served after about a 10 minute wait. This was extreme. Usually the drink somewhat resembles what you expect. 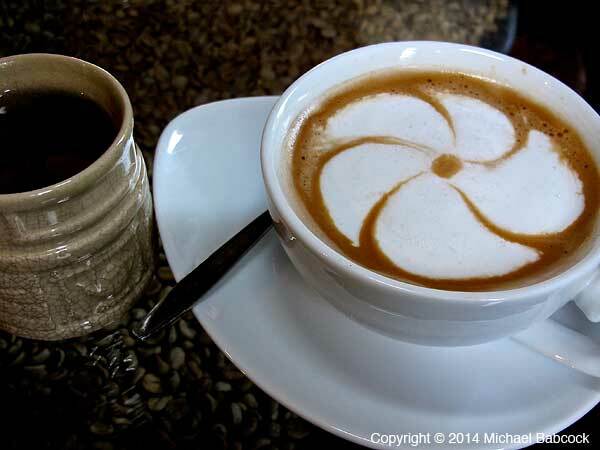 Although when we were at Pak Meng beach in Trang (down south), Kasma ordered a latte and I ordered an Americano, which is supposed to be a black coffee. When the two drinks came, they looked identical. Kasma asked “Which is the latte?” The waitress looked dumbfounded for a brief time, then put one down in front of Kasma and said: “This can be the latte. 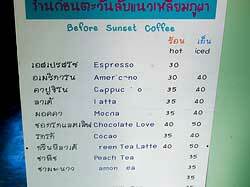 They’re the same.” There was one difference: my “Americano” cost 5 baht less. My advice from the first blogs holds: order what you want, don’t be impatient if it takes awhile and enjoy whatever it is you get. Next time, try another place. Consider it a tasting adventure and see yourself as being part of an evolving cultural phenomena. 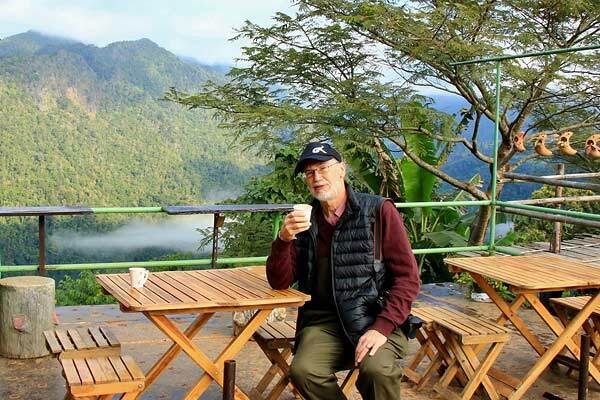 Traveling in the north, we encountered a number of coffee fields. 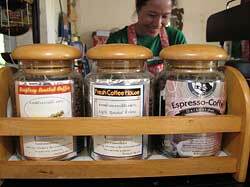 Coffee is cultivated up north and it’s not unusual to see coffee shops which serve locally grown and roasted beans. 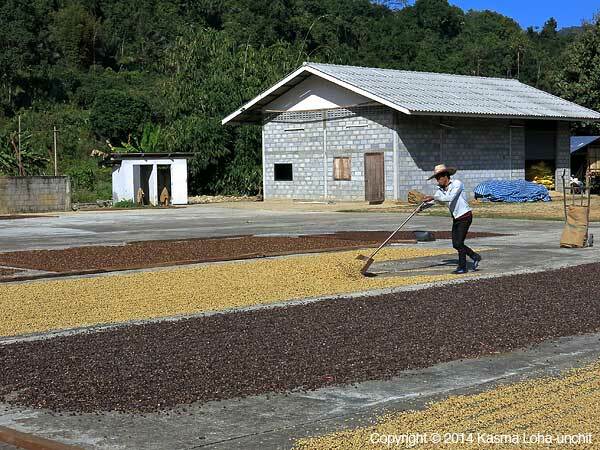 At Tha Wang Pha in Nan we sought out some coffee fields and when we saw beans drying in the sun we stopped to see if we could buy some unroasted coffee beans for a friend in the United States. Unfortunately, they would only sell us wholesale quantities so we couldn’t make the purchase. 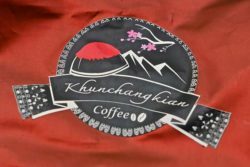 For the rest of the blog, I’d like to showcase 3 of the places where we had coffee up north, beginning with Phu Coffee in Nan. 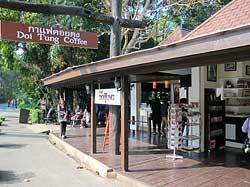 Phu Coffee (pronounced “poo” in Thai), is found in the tourist center across from Wat Phumin. There’s a coffee shop out front – Nan Coffee – that wasn’t bad but we preferred Phu Coffee, which is located inside the courtyard and off to one side. 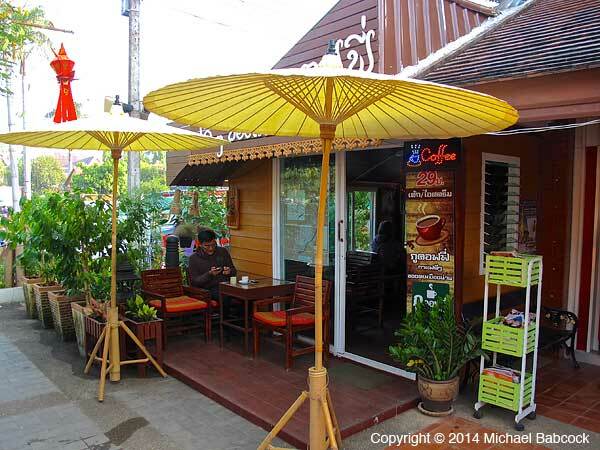 Look for the yellow umbrellas. 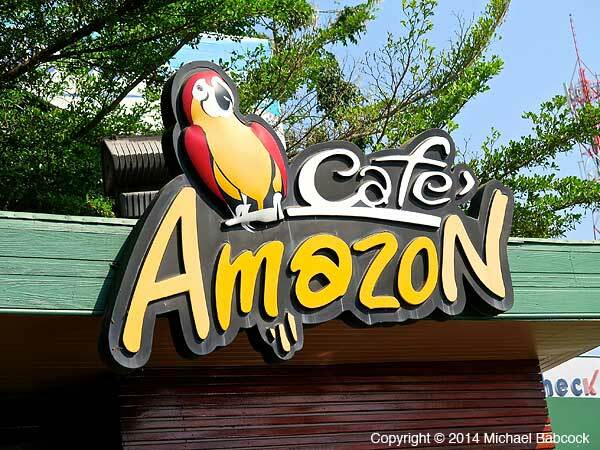 All of their coffee is grown locally. 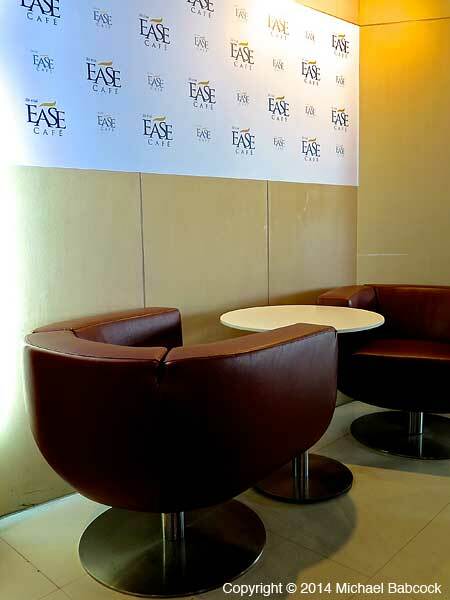 The indoor seating was cozy and comfortable. 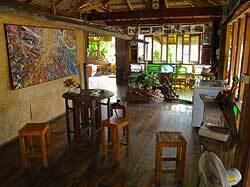 This was very much a local coffee shop. The beans were local from Doi Phu (Phu mountain) and they also sold coffee beans to take home. 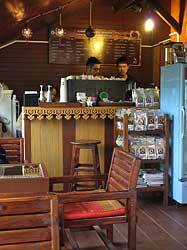 Service was quick and efficient and the prices were more than reasonable: hot mocha, cappuccino and latte were only 25 baht while iced drinks were 30 baht. The coffee was quite good, and presented very nicely (see the first picture of the blog of the mocha and the picture of the latte above right). 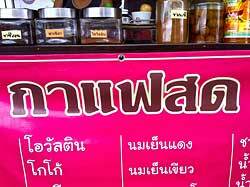 The coffee was served in what I think of as traditional Thai style: accompanied by a cup of tea to serve as a chaser after you finish your coffee. 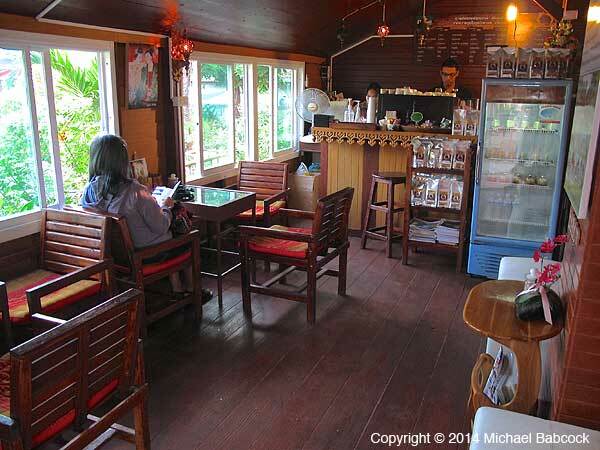 The tea was surprisingly good here: it was brewed to order, which is not usually the case at Thai coffee shops. We came here 3 mornings in a row while staying in Nan. I highly recommend it. While we were in Chiang Rai we made an excursion to Doi Tung, perhaps the best known tourist destination in Chiang Rai province, known for the Royal Villa of the late Princess Mother (mother of the current and previous king) and the Mah Fah Luang Garden. When we arrived that morning, we stopped first at Café Doi Tung. 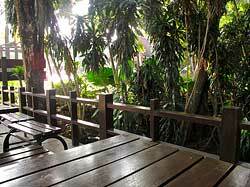 The seating is outdoor in a covered area and there’s a lovely view of the mountains in the distance. 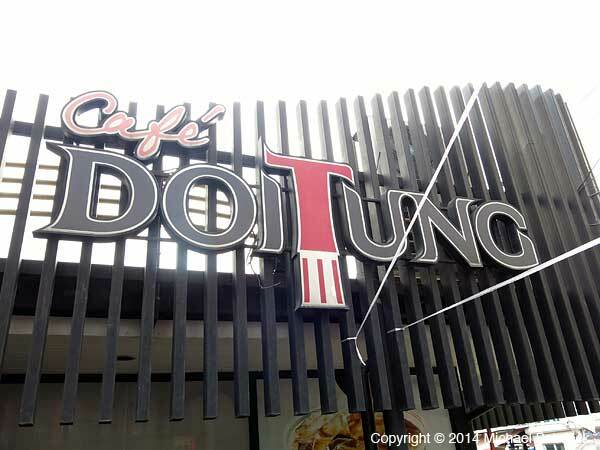 The beans served here are from those mountains (doi means mountain so Doi Tung is Tung mountain) and have been grown as part of the Doi Tung Development project (started by the Princess Mother) since the late 1980s. 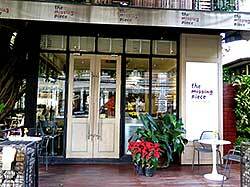 The café is a bit more like a coffee house such as is found in the U.S. 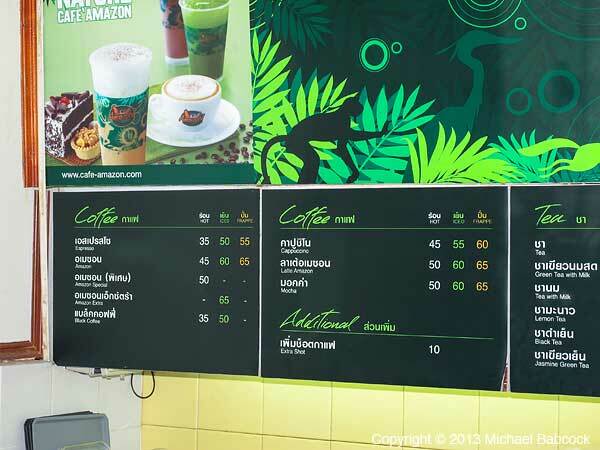 The drinks are larger – 12 ounces rather than the more prevalent 8 ounce size in Thai coffee places – which was reflected in the price – 75 baht for a latte, 70 baht for a cappuccino, 85 baht for a mocha (more usual prices for the smaller drinks elsewhere are 40 – 45 baht). They also had a substantial array of pastries and sweets (which is not the norm in Thailand), such as coffee cake, carrot cake, layer chocolate cake, green tea cake, macadamia fruit cake, macadamia mocha cake and macadamia nut brownies. We sampled the brownies, which had good flavor (great with the nuts) but could have been a bit moister for my preference. Still, they were very good. I had a latte and Kasma a mocha. 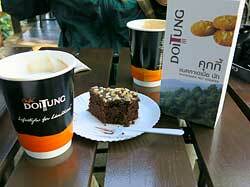 It was excellent coffee and served very efficiently. After spending the day at the various attractions, we returned to the café in the later afternoon and enjoyed a Macadamia Nut Slush: it had lots of cream, some caramel and crushed macadamia nuts. 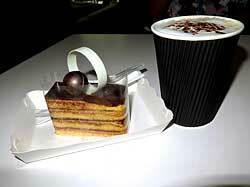 It tasted heavenly: a perfect way to end the day. The café also sells a number of other items that are produced locally, including roasted coffee beans in three different roasts (light, medium and dark). We purchased a number of items, including macadamia nuts (which they grow), macadamia nut cookies (very good), macadamia nut butter (my, was this good) and a box with 6 pouches of Doi Tung coffee, each one used to make an individual cup of drip coffee. 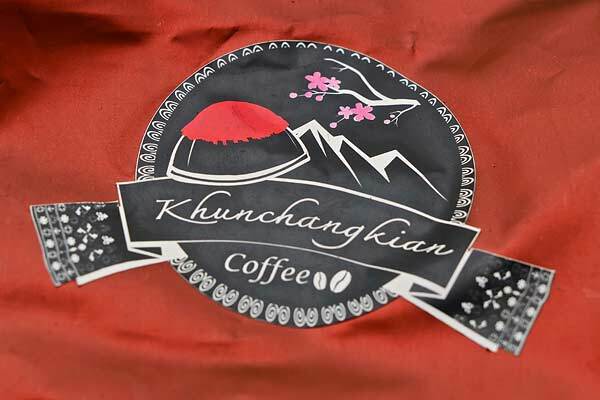 We enjoyed the coffee so much that we were pleased to learn there are a number of branches in Bangkok. 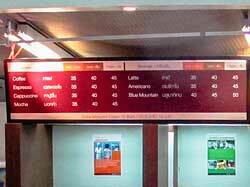 We were very happy to visit the branch at Chatuchak market (on Kamphaeng Pet 2, directly next to the parking lot) later in the trip. 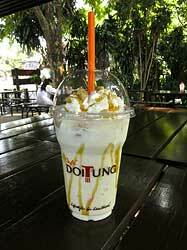 Check out the Café Doi Tung Website. 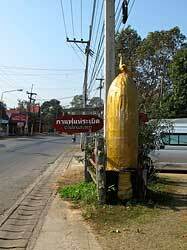 Driving from Phrae to Sukhothai we drove past a coffee hut with a bomb in front and did a quick u-turn. 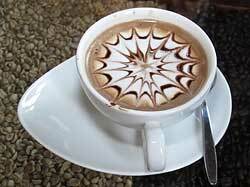 Exploding coffee? We had to give this a try! 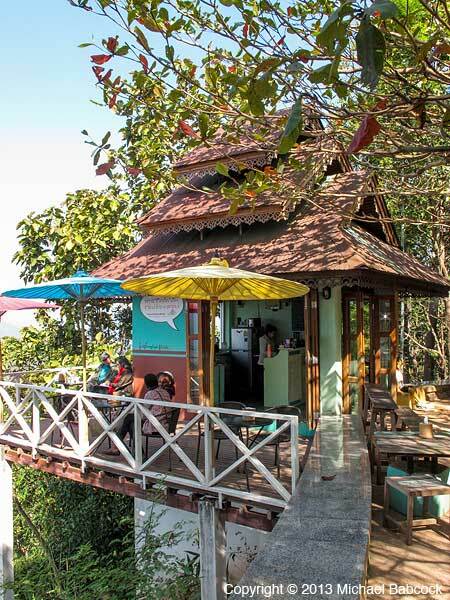 This, by the way, is a good example of a coffee place pretty much in the middle of nowhere, something you did not see very much even a couple of years ago. It was a lovely coffee house named กาแฟแห่ระเบิด, which they translate as Bomb March Coffee. 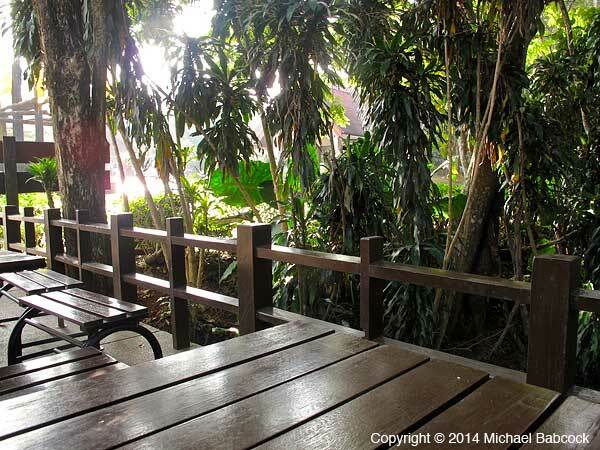 There was greenery and inviting places to sit, a water feature (water falling through bamboo) and some modern art on the wall. In the background, Christian devotional choral music played (? ); this is the only time in my 21 years visiting Thailand I’ve heard such a thing. The coffee was quite good, the barista efficient. Kasma was able to get the story mainly from information on posters and pictures on the walls, which were all in Thai. During World War II Thailand was essentially occupied by the Japanese; Thailand allowed them into the country to prevent bloodshed on her population. There was an important bridge on a main supply route in this area, which the U.S. bombed. Three unexploded bombs were later found in the river and surrounding mud, which the villagers collected. They took the gunpowder out to make into smaller explosives to use for fishing (though another story has the Thai soldiers emptying the bombs first). After some 30 years, in Buddhist year 2516 (1973, Western calendar), the heavy metal bomb casings were cut to make into large bells and, with a great procession, intsalled in 3 of the local temples. 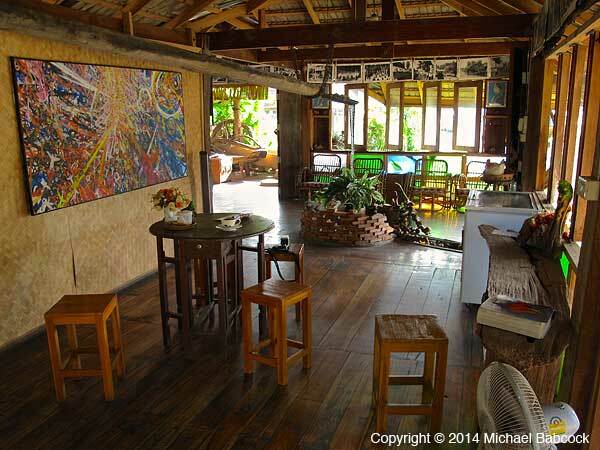 A fascinating history at a fascinating coffee house. Kasma later found out, by talking to some locals, that the coffee hut had been there for some time and was in danger of closing. 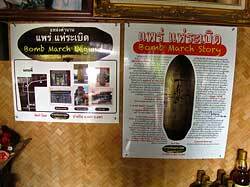 After transforming it into Bomb March Coffee, adding the historical information and bomb decor, it has flourished. 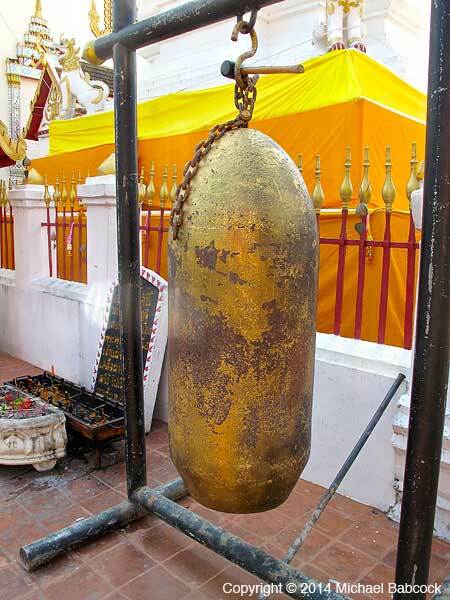 We visited the temple Wat Sri On Khom in Long where we saw one of the 3 bombs that were transformed into temple bells. You can check out Bomb March Coffee’s Facebook Page. Here’s a Map of their location for next time you’re motoring through Phrae province! Over the past few years there has been a proliferation of places selling fresh-brewed coffee in Thailand. 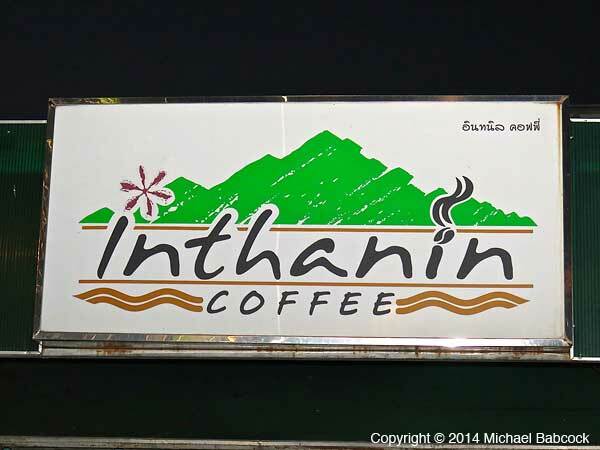 This blog follows part 1 in looking at some of the places where this phenomena is taking place and in looking at at what to expect when ordering coffee in Thailand. This is a continuation of Coffee in Thailand, Part 1. 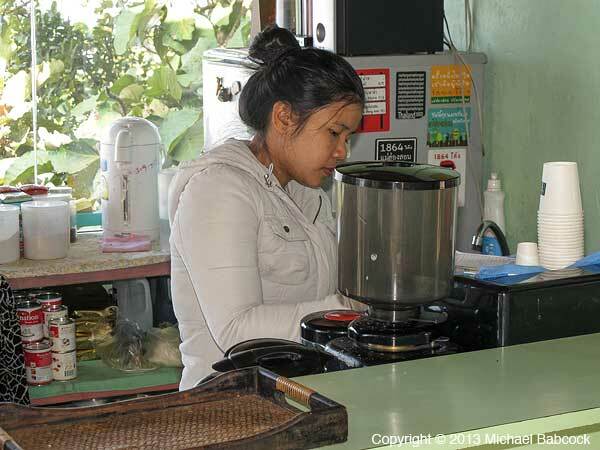 Many restaurants, particularly noodle shops (or roti restaurants) serve the more traditionally available kafae yen (see below). One place where you can increasingly find coffee stands is at gas stations. 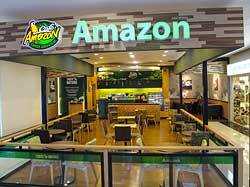 Often they will be a chain, such as Amazon (as to the left), but on other occasions, just a one-off shop. 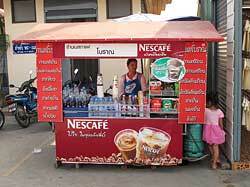 There are two gas stations in Samut Prakan near our townhouse: both have a “coffee hut” attached to them. Some of these outlets are very efficient: a tour bus will roll up and they’ll turn out the drinks. Some other outlets are not so efficient: they seem flustered when they have more than a couple of customers. Presumably, the large tour operators have figured out where to stop. 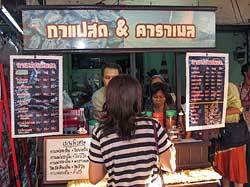 You’d find this mainly at street stalls and some noodle shops; they also invariably offered Thai iced tea – ชาเย็น (cha yen). 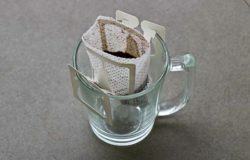 The coffee is made by putting the grounds in a coffee “sock” and seeping it in water, much like making tea; sweetened condensed and evaporated milk are then added. 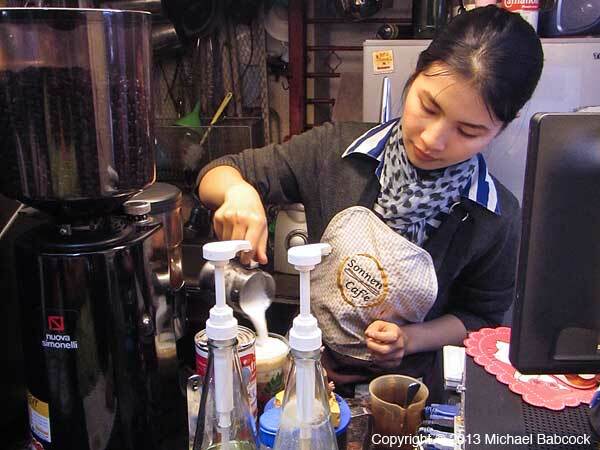 (Kasma’s instructions for making Thai Iced Tea) can easily be adapted for kafae yen.) It was, and is – it’s still widely available in markets – easy to find such stalls by looking for the characteristic metal pots with the coffee socks in them used to brew the coffee (see above right) and also by the stacks of condensed milk at the front of the stall. 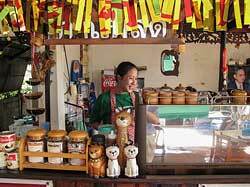 There are still many stalls and noodle shops that serve kafae yen and cha yen, such as the one above in an Ayuthaya market. 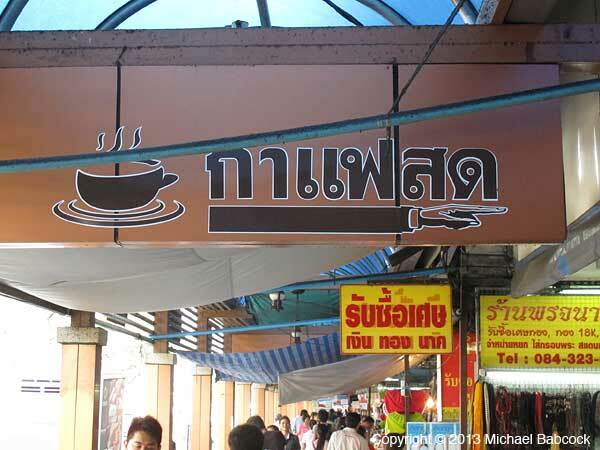 The main heading on the sign to the above right is กาแฟโบราณ – kafae boran; boran literally means “ancient” so the sign is advertising “Coffee in the old-style.” If you click on the picture you’ll get a larger version where the text is easier to see. 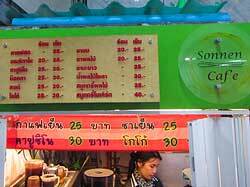 The first two items on the lower left are กาแฟเย็น (kafae yen) – Thai Iced Coffee – and ชาเย็น (cha yen) – Thai Iced Tea. The other items on the sign include tea with lime, Nescafe (instant coffee), black tea, cocoa and oliang, which is iced coffee without the added condensed or evaporated milk. 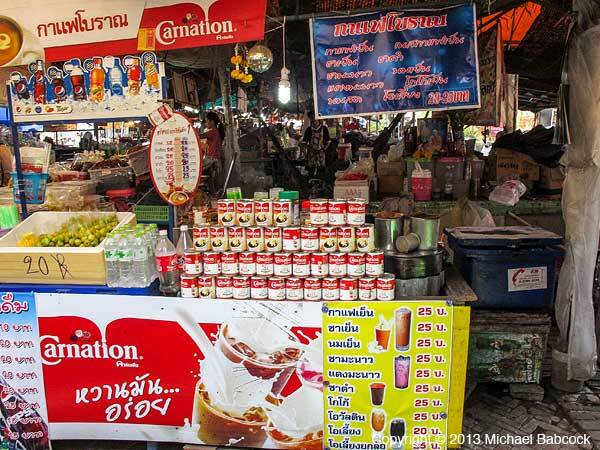 These items are sold at pretty much all similar stands; many also offer Ovaltine. 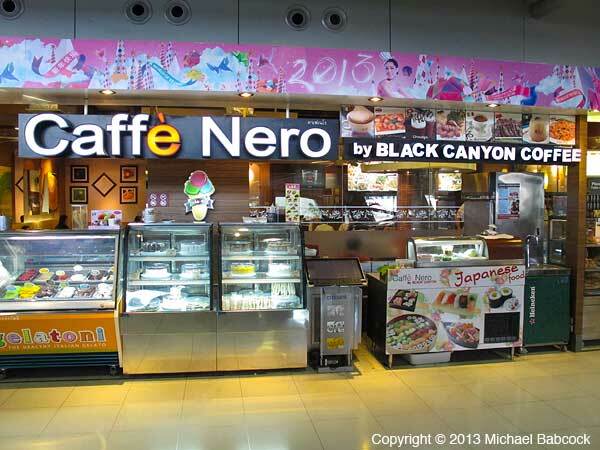 The first western-style coffee I remember seeing was with a chain – Black Canyon – that is fairly widespread, particularly in malls and at the airports; there are a number of different chains in Thailand (more later on this). 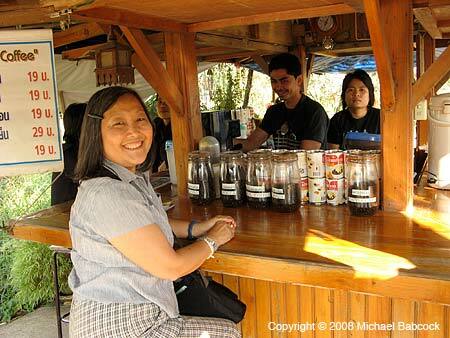 Then, a few years ago, as early as 2004, individual coffee stands started to appear. 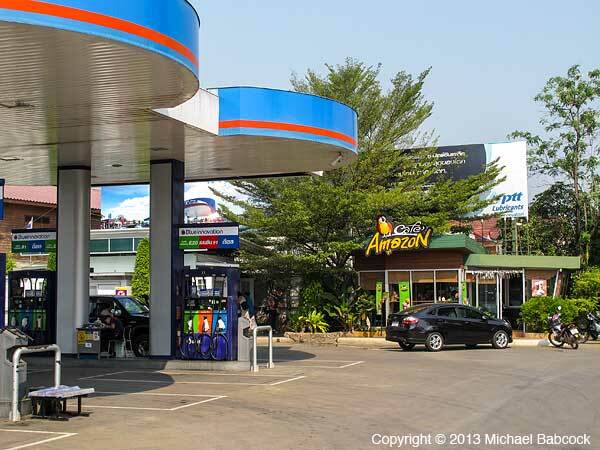 We would see these both at stand-alone locations and also connected to gas stations. The quality was always a bit iffy at these stands. 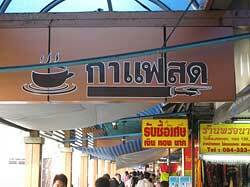 There are a number of coffee chains in Thailand. 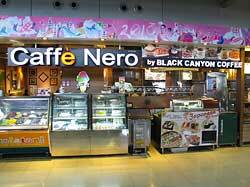 The first was probably Black Canyon and they also have a spin-off chain associated with them called Caffé Nero. I see them mainly in shopping malls and airports. 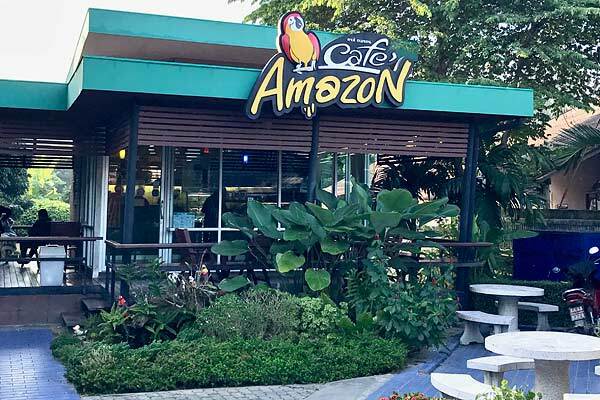 Then there’s Amazon – perhaps a little more widespread: I see them in some shopping malls and also at a number of gas stations. 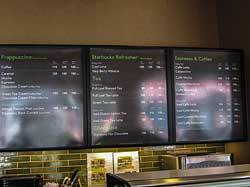 Then there’s the biggie – Starbucks. 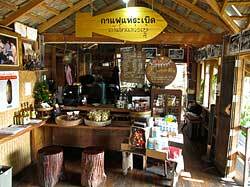 You find Starbucks in malls, in many stand-alone shops across Bangkok, Chiang Mai and other cities (such as Hua Hin), particularly where there are westerners. Another chain is Rabika. There’s Coffee World, founded in Bangkok, that has locations in 9 countries. There are others whose names I don’t know. 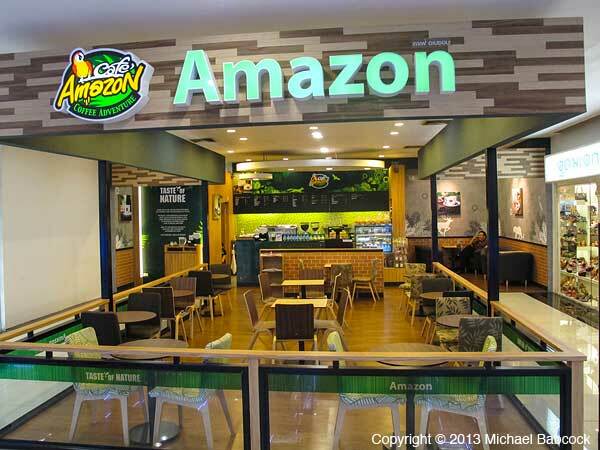 The only chain where I’ve bought coffee recently has been Amazon. 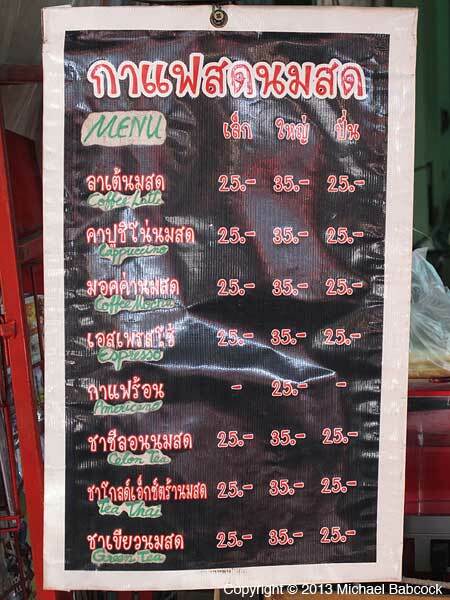 The prices there are at least competitive and reasonable; the other chains seem to like to charge much more. 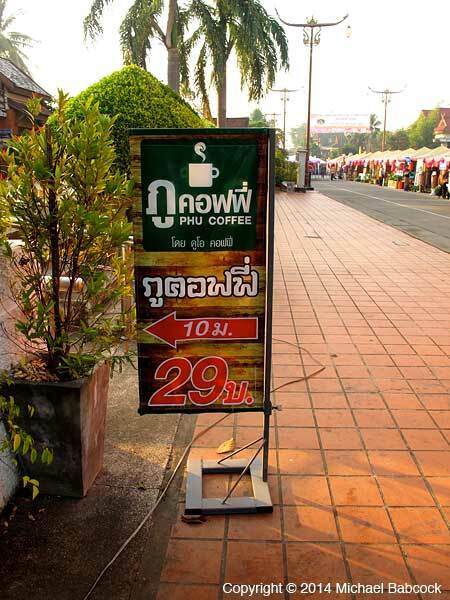 The prices depend on where you get the coffee. At most of the stands, the price for a latte seems to be anywhere from 30 to 45 baht for a hot latte with 35 or 40 pretty standard: figure on an extra 5 to 10 baht for an iced latte. Most lattes seem to be about 10 ounces, not as large as some of the ones in the U.S. The chains are generally higher. 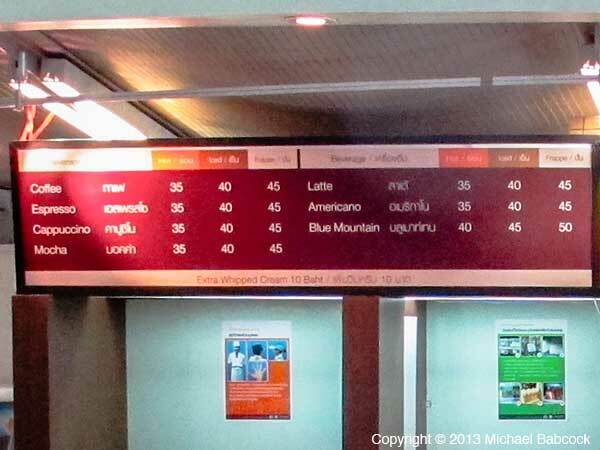 Amazon seems the most reasonable with a latte costing about 50 baht (hot) or 60 baht (cold). 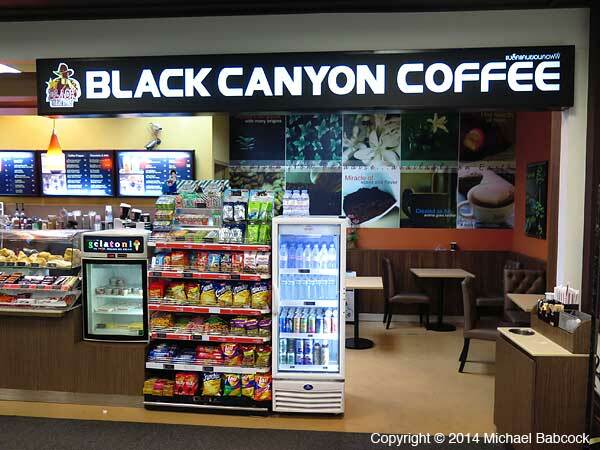 The Black Canyon I checked out was 95 for a hot latte and 110 for an iced. 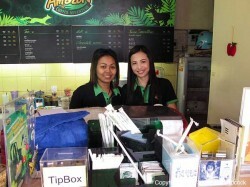 At the Starbucks in Hua Hin, the prices were 85 and 100, respectively. It’s possible that these drinks are larger: I’ve not tried them. 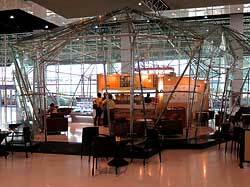 At Suvarnabhumi airport in Bangkok, we avoid the chains (Cafe Nero, Starbucks) on the 3rd floor, where you pay 90 to 100 baht for a latte. 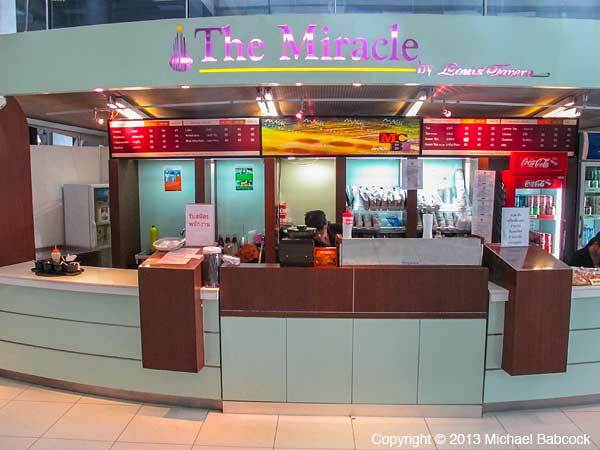 Close to the domestic arrivals on the second floor, there’s a stand called “The Miracle” that has a latte for 40 baht. Quite good. 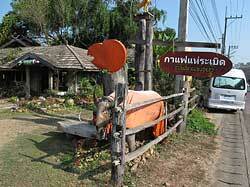 What you get in Thailand is not always what you expect based on your experience elsewhere. I suggest that you order what you think you want and enjoy what you get: it’s sometimes difficult to convey what you do or don’t want and the barista is probably used to making it a certain way. It’s a good chance to practice being flexible. 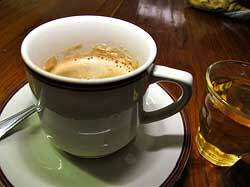 One thing you won’t get is decaffeinated coffee: I’ve never seen it anywhere. 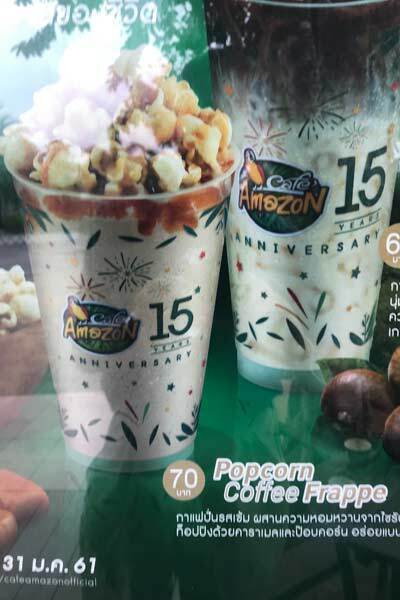 As far as I know, they didn’t even have it at the Starbucks in Hua Han. 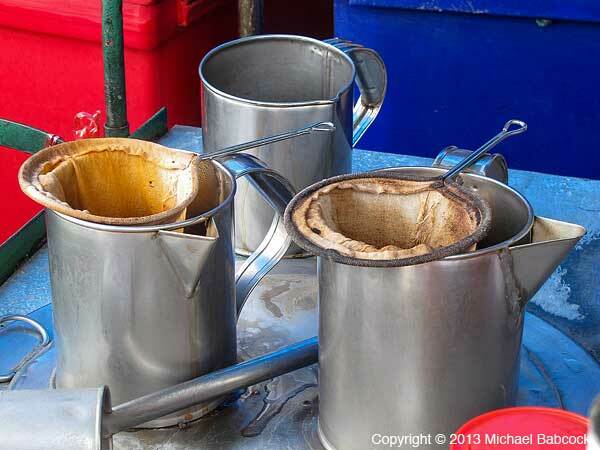 At many places, particularly (in my experience) the smaller, street-side stands, a latte includes condensed milk. 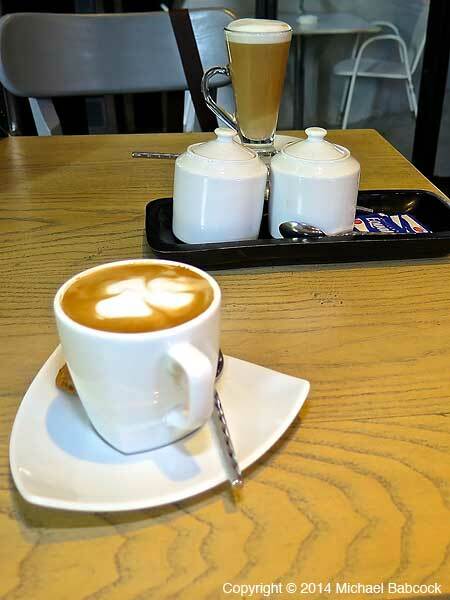 At the stand in Thong Lo (talked about in Coffee in Thailand, Part 1) the latte was made by adding espresso to a cup with some condensed milk and some heated milk – no steamed milk at all. 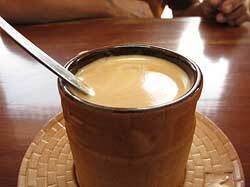 In some of the indoor stands I’ve gotten a latte that had some condensed milk added. It adds a sweetness and it sure isn’t a latte as I think of it from my experience elsewhere. 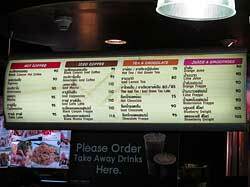 It’s possible that you get more consistency at the chains, though I can’t verify this with Starbucks or Black Canyon. I have had a number of drinks at different Amazon outlets and they can vary quite a bit. Many other places do steam the milk and make a latte in the traditional fashion – steamed milk added to the coffee and a certain amount of foam and volume to the milk. 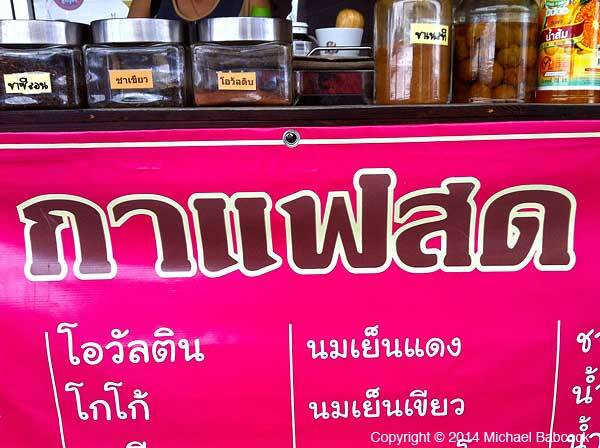 My favorite place in Samut Prakan does it this way and makes a wonderful version. 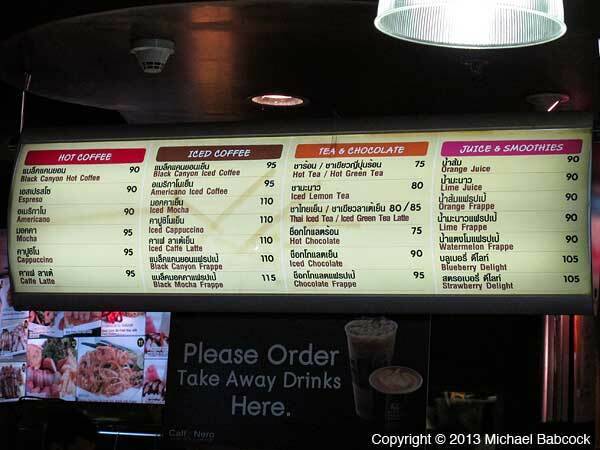 The iced drinks are a little more standard: condensed, sweetened milk is just part of the deal, along with the ice and coffee. 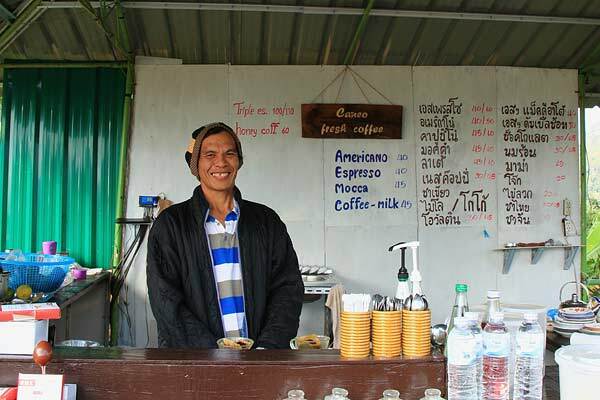 Many Thais seem to prefer the iced drinks; That’s often what Kasma usually orders – an iced latte or a mocha. 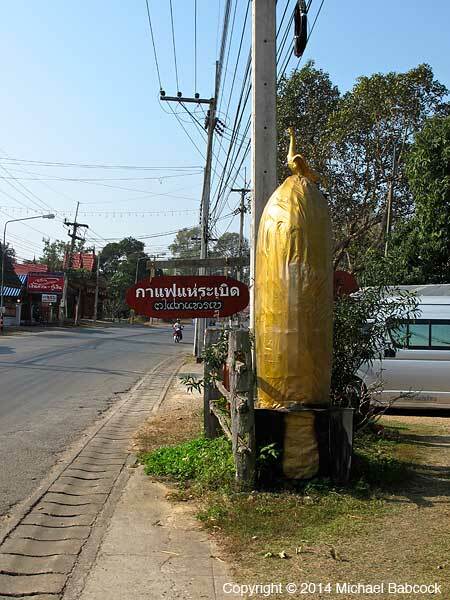 Given how hot the climate can be in Thailand, that does make a certain amount of sense. 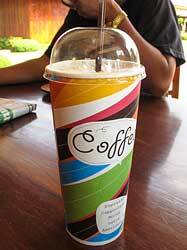 The iced drinks are fairly similar to a kafae yen though usually not as sweet. 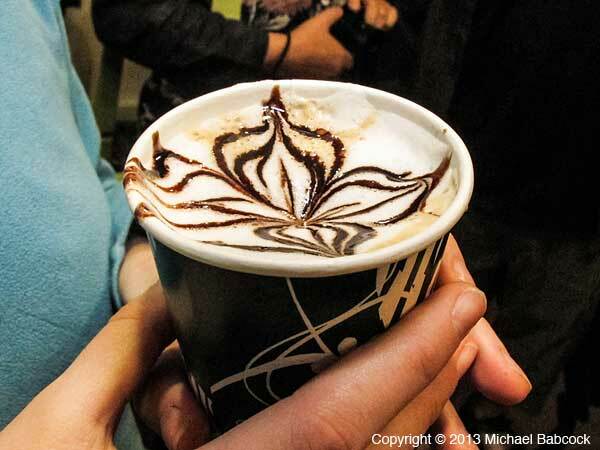 One recent trip member said one mocha she ordered was very much like a Starbucks Frappé. 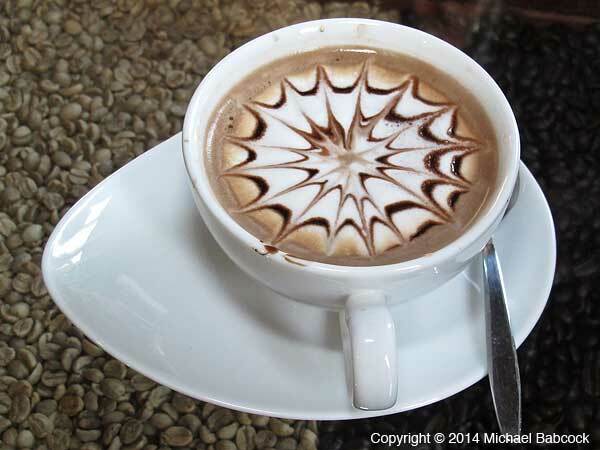 Mochas can very quite widely, from very chocolaty to not very chocolaty at all. 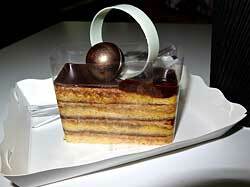 Often cocoa powder is used. 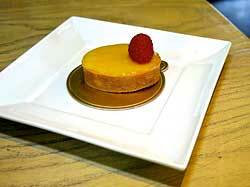 The sweetness can vary quite a bit, as well. 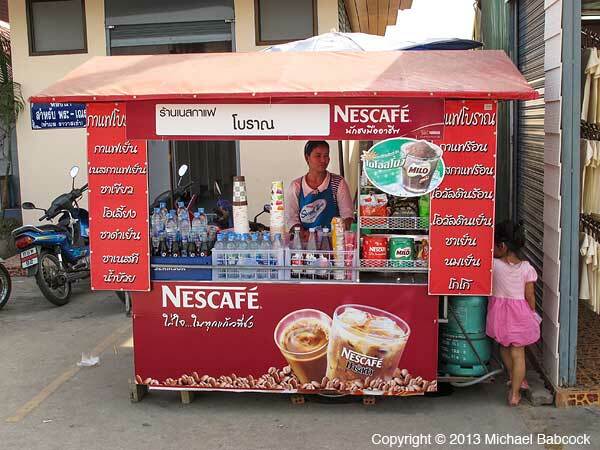 You usually need to have some patience when buying coffee in Thailand. Often each cup has to be ground to order and carefully made by hand so you usually can’t just pop in and out. 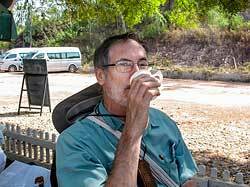 There are, of course, exceptions, such as the coffee hut at a gas station where we stop on the way down south that is used to dealing with busloads of tourists. 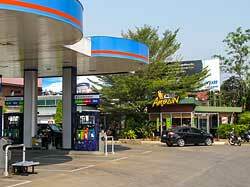 However, at another gas station, it can take an inordinate amount of time to get a cup of coffee. It’s best to never go into a stand expecting instantaneous, speedy service. 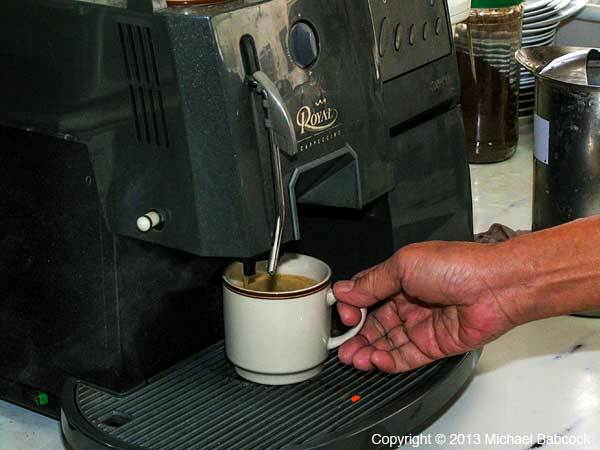 Most places where I asked the origin of the beans, I was mostly told that they were just ordered from their supplier. 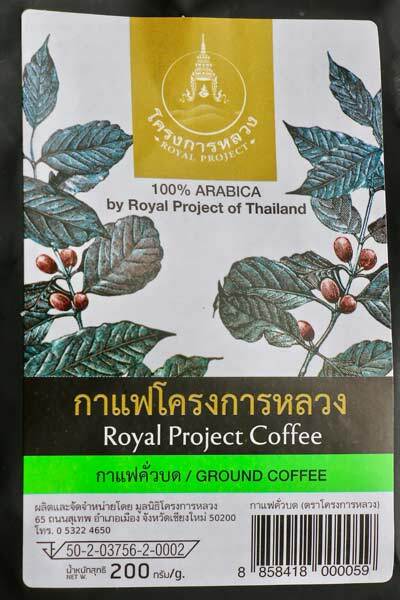 At least some, possibly a great deal, of the coffee is grown right in Thailand. The Akha hill tribes in Chiang Mai and Chiang Rai are growing coffee. 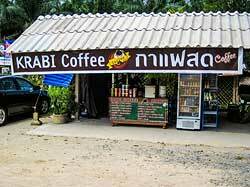 Throughout Krabi province you’ll find stands advertising “Krabi Coffee” and it is coffee that is grown in Krabi. 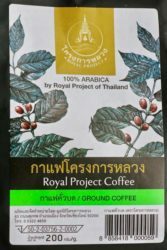 I spoke to a Thai man who said he was opening a series of coffee shops throughout Thailand (I did not get the name) and that his coffee was coming from Malaysia. 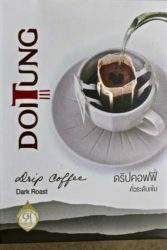 Coffee in Thailand, Part 1. Coffee in Thailand, Part 3 (The North). 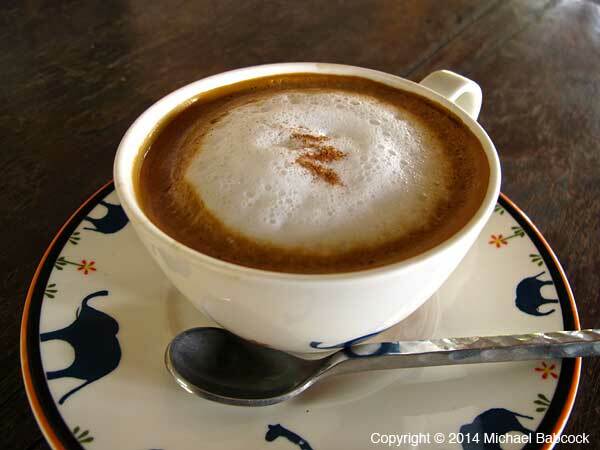 Coffee in Thailand, Part 4. 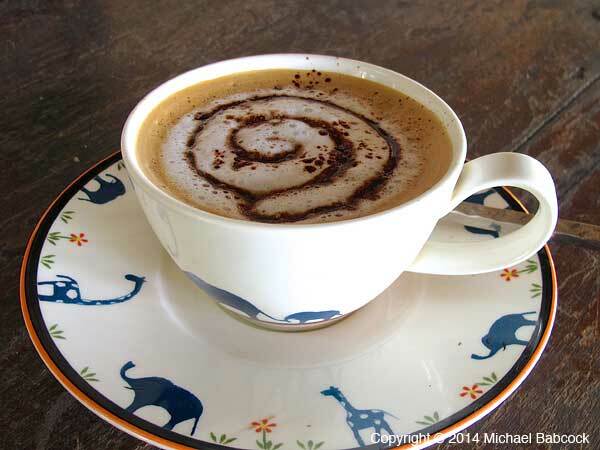 Coffee in Thailand, Part 5. 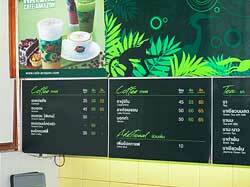 Over the past few years there has been a proliferation of places selling fresh-brewed coffee in Thailand. This blog looks at some of the places where this phenomena is taking place. 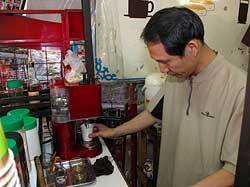 For the most part, the coffee is pressed coffee (as with “espresso”), made to order. 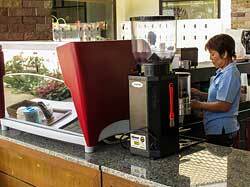 More often than not, you’ll see the whole beans and the grinding mechanism in the same place – at many of the smaller places, the coffee is ground to order. 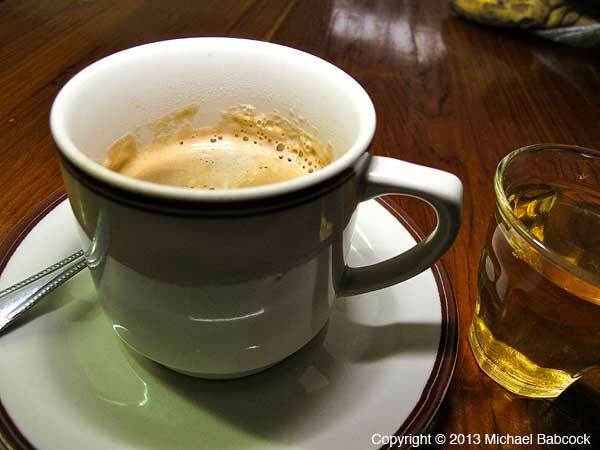 Most of the coffee is dark-roasted; sometimes overly so. There is a lighter roast called “Blue Mountain” that is available at some places – I tend to order that when it’s available and find it much to my liking. 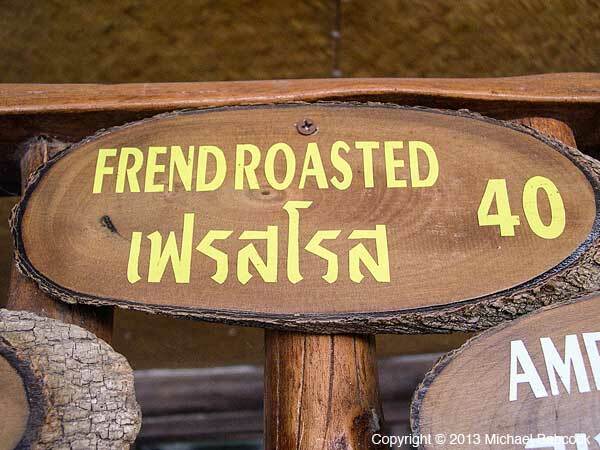 If you’re a coffee drinker, you’ll want to memorize two words of Thai in the Thai script (spelled without an intervening space): กาแฟสด, pronounced kafae sot. 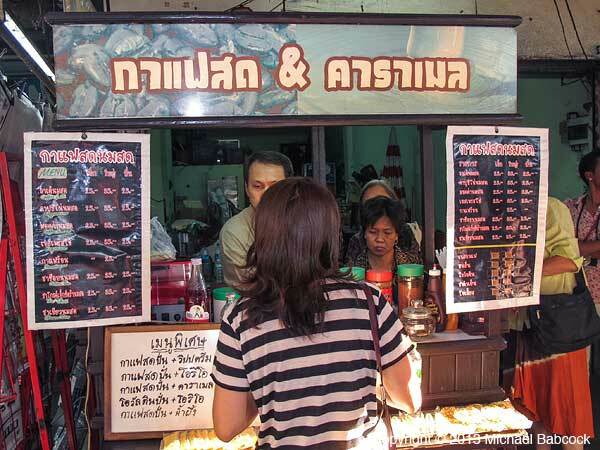 กาแฟ (kafae) means “coffee” and สด (sot) means “fresh” – so “fresh coffee.” It’s probably not strictly necessary because the stands and cafes selling coffee are also recognizable by the espresso machines and the coffee beans they usually display; in addition, the signs often include a cup of coffee (as to the left). In some places, there’s a sign in English. On other occasions, knowing the script has helped me find a place I might have overlooked. 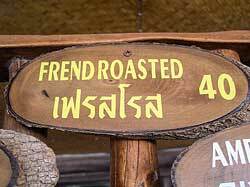 I’m now finding these “fresh coffee” stands all over Thailand. 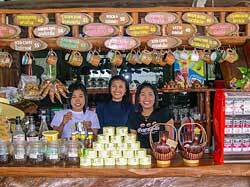 In Bangkok, Chiang Mai and other larger towns, you’ll find them on the streets and in markets, often just a simple cart with the coffee grinder and a small espresso machine. 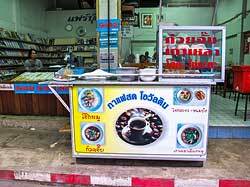 The picture below shows a coffee stand found on Sukhumvit Soi 55 (Thong Lo – pronounced “tawng law”). It’s a fairly typical example. 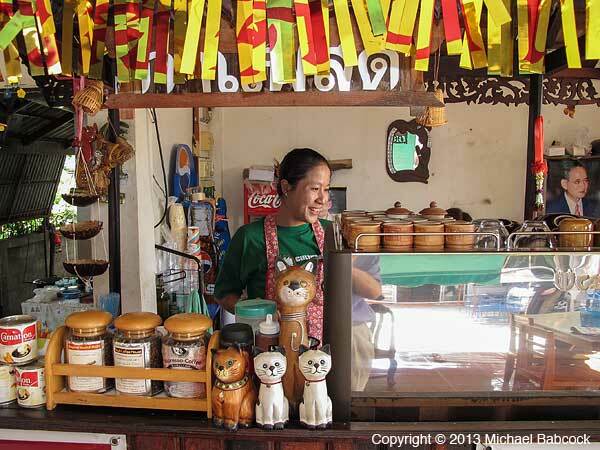 The pictures below show another coffee stand, this one found at Worarat Market in Chiang Mai. The barista makes a very good cup of coffee. 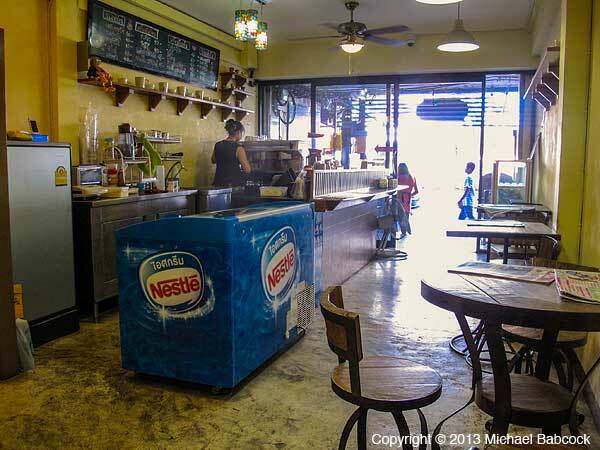 I am seeing more places where you can purchase a coffee and sit down. 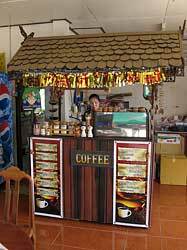 We visit a the Sathorn Golden Textile Museum in Sri Satchanalai (in Sukhothai province) that has this coffee stand; they have excellent “blue Mountain” coffee. 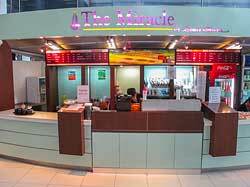 This stand is found indoors amongst a number of other shops. 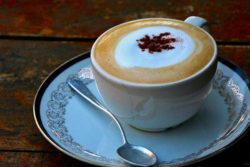 I’m guessing that much of the increase in popularity of coffee initially was driven by Western tourists who wanted their morning fix. 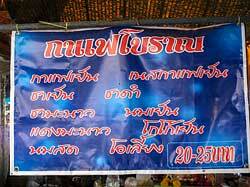 Now more and more Thai people seem to be embracing the drink. 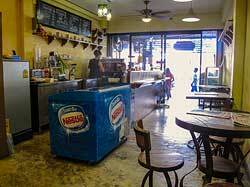 “Coffee houses” are making their appearances in the neighborhoods as well. 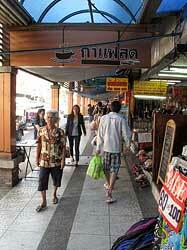 Kasma owns a townhouse out in the Samrong district of Samut Prakan, which is immediately adjacent to the SE corner of Bangkok. 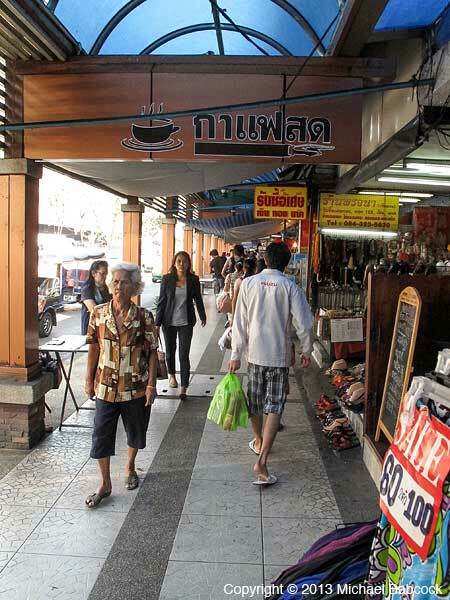 It’s a very Thai neighborhood: usually I’m the only westerner I see on the streets, in the markets, or even in the Imperial World shopping center across the way; Imperial world has at least 7 or 8 non-chain coffee shops in addition to Amazon, (one of the chains). 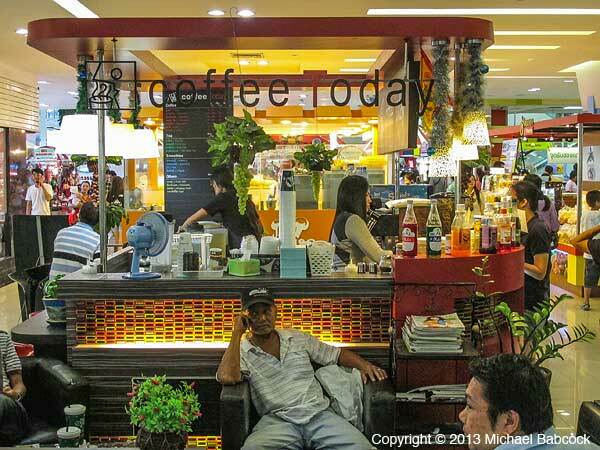 With so few westerners to be seen, Thais must be buying coffee. Even in the local fresh market there (Talat Samrong), there’s a fresh coffee stand. I do know that over the past couple of years our driver, Sun, is drinking more coffee. 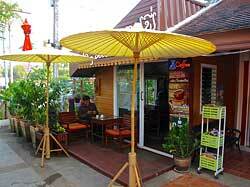 My favorite place to get coffee is a no-name coffee house on Sukhumvit Road in Samrong. This cafe is found on the odd-soi side of the Sukhumvit between soi 111 and 113, marked only by a กาแฟสด (kafae sot) sign. 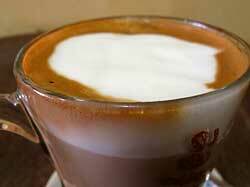 They make a rich coffee made with foam, a real caffe latte. (The second picture in this blog, at the top of the page, is a caffe latte from this cafe.) 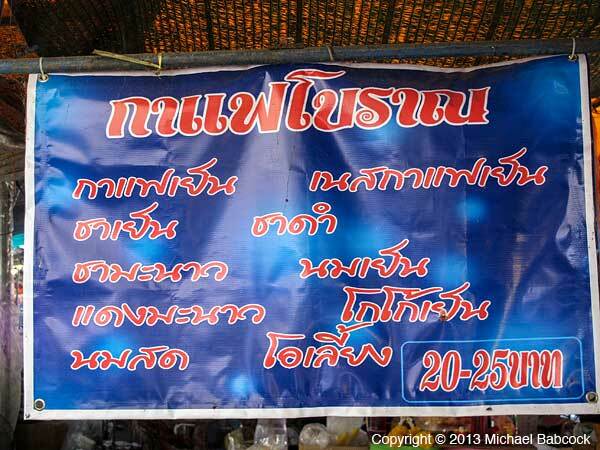 Thais must be it’s primary customers: there just are not enough of us fahrangs (the Thai word for westerner). This shop is owned by a young lady who says it is her “hobby.” She also has a regular job. I’ve only seen her there once; the other times there’s been the same young woman employee, friendly and competent. 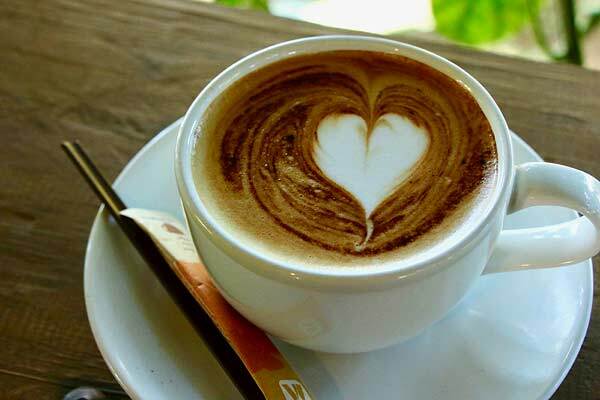 I don’t think the cafe has free wi-fi, like so many coffee houses in the United States,; I imagine it’s only a matter of time before this is commonly offered. I have seen it advertised at coffee houses in the touristed areas, particularly in Bangkok and Chiang Mai. Many Internet cafés also sell coffee; I frequent one in Chiang Mai. 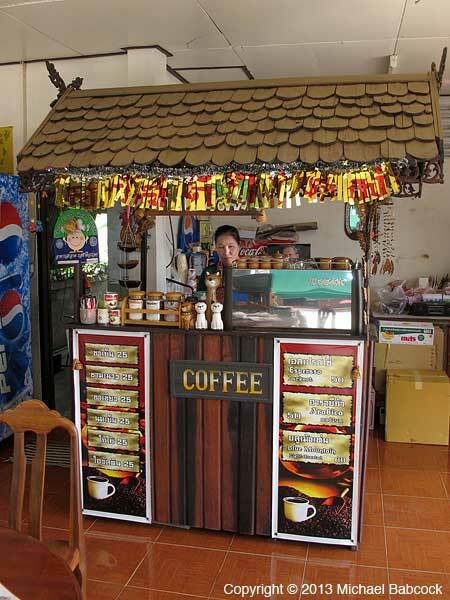 Over the past several years, coffee stands such as this one have become fairly common throughout Thailand; at least in the areas where Kasma takes her small-group tours to Thailand. 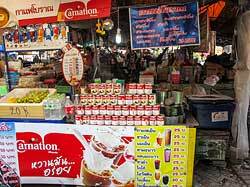 You’ll find them an many gas stations, in markets, on sidewalks or, as with this stand in Suhkothai, by the side of the read. The coffee is usually quite good. Typically, each cup is ground and brewed to order. 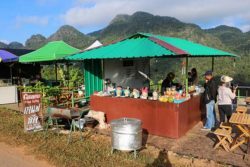 Many of the stands have a type of coffee that is called “Blue Mountain” – it does not refer to the Jamaican bean, rather it refers to a way of roasting the bean and it is really quite good.